Welcome to the Hearth and Soul Blog Hop, the hop for recipes using healthy ingredients, comfort food recipes, articles about healthy living, real/slow/local/sustainable food, foraging, herbal remedies, organics and gardening. Thank you to everyone who joined in last week! This week I’m celebrating! It’s The 11th Anniversary of The 21st Century Housewife. Check out my 11th Anniversary Post for some of the highlights of the last eleven years and please do enter my Celebration Giveaway! This week I’m featuring some of the Gluten Free recipes shared with last week’s hop. Please read our Mission Statement and Guidelines to ensure the post you are sharing fits within them. We share your posts on Pinterest, either on the hosts’ own boards and/or on our shared board Recipes from Hearth and Soul Hop Contributors. By linking to the hop you are giving permission to feature your properly credited posts and photos here on The 21st Century Housewife as well as on Facebook, Twitter, Google + and Pinterest. Please link back to one of the hop hosts – through text link or a badge – within your linked post. Please share the hop badge below to help promote the hop. To get all my latest posts in one convenient weekly newsletter, please take a moment to subscribe in the box below the linky / above the comments. The email arrives on Tuesday morning so it’s also a great reminder to join us at the Hearth and Soul Hop. Have a lovely week! 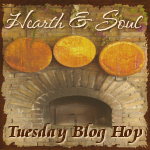 Thank you for hosting Hearth and Soul, April, and congratulations again on 11 amazing blogging years! Hope you have a great week! Thanks for hosting the party. Congrats on eleven years too. All your features look so yummy! I am sharing my meal plan and recipes and a little country chicken and biscuits, some cozy foods. Hope you are having a great week and thanks for hosting! I love Chicken and Biscuits, Miz Helen! I look forward to seeing your recipe. Hope you have a great week too! It is a chilly morning here in NY… so I brought my beef barley soup to the party. Have a lovely week and thanks. I must check out your selections, they look so good! Congrats on your 11 years! Today I shared, “A Passion for Pumpkins: How to Make Your Own Pumpkin Seed Milk”, “10 Great Reasons To Go Crazy for Coconut Oil”, and “Food for Thought: 26 Eco Smart Ways to Reduce Home Food Waste”. Thank you for hosting The Hearth and Soul Hop. Hi Deborah! These sound like great posts. I look forward to reading them!